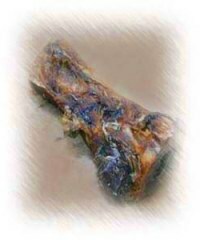 A piece of roasted meat represents the lamb that was the special Paschal sacrifice on the eve of the exodus from Egypt, and annually, on the afternoon before Passover, in the Holy Temple. Since we can't offer the Paschal sacrifice in the absence of the Holy Temple, we take care to use something that is relatively dissimilar to the actual offering. Accordingly, many communities have the custom to use a roasted chicken neck or the like. Preparation: Roast neck on all sides over an open fire on the stove. Afterwards, some have the custom to remove the majority of the meat of the neck. Role in the Seder: The shank bone is not eaten. After the meal it is refrigerated, and used a second time on the Seder plate the following night.